Photo Reflection of the Day #143: Romeo & Juliet Walk Into a Cemetery.. 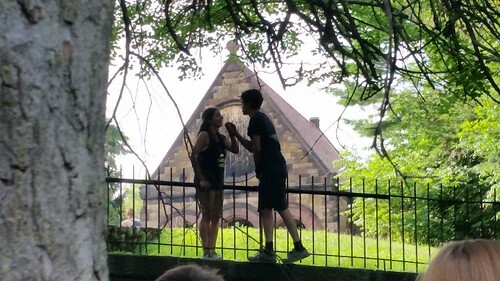 The balcony scene from Romeo & Juliet but in a cemetery. I went to see Arts After Hours Romeo & Juliet--it's part of their annual Shakespeare in Park summer performance. This year, they decided to have the play in a cemetery--which of course, for a Shakespearean tragedy is quite apropos. In addition to putting it on in the park, it was also a walking play--that is, the audience moved from scene to scene throughout a small section of the cemetery. Overall, I really liked the experience. There were some issues for sure with acoustics and it probably works best with plays people are typically familiar with because you are apt to miss bits and pieces as you get from scene to scene. But it worked quite well. They found many good places to enact scenes and by the second act, the rhythm of movement had largely been figured out. They also did some creative things with the play which included inviting attendants to participate in the ball and having actors since modern lyrics to hold off dialogue until people had gotten to the scene. Also, it was entirely free to attendants. You were invited to donate at the end (which we certainly did) but the performance was open to everyone. I definitely recommend checking it out as it's going on the next two weekends!